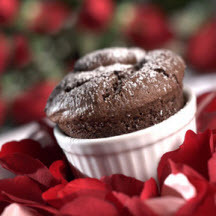 A surprisingly simple-to-make chocolate dessert soufflé that is sure to please. Savor the intense flavor of the rich chocolate with a creamy caramel secret treasure hidden in the center. Preheat oven to 400°F (205°C). Spray 2 (6-ounce) ramekins or custard cups with nonstick cooking spray; coat lightly with granulated sugar. Microwave morsels, butter and cocoa in medium, microwave-safe bowl on HIGH (100%) power for 45 seconds; stir. Microwave at additional 10-second intervals, stirring until smooth. Stir in egg yolk and vanilla extract. Beat egg white in small mixer bowl until soft peaks form. Gradually beat in 2 tablespoons granulated sugar until stiff peaks form. Stir 1/4 of egg white mixture into chocolate mixture to lighten. Fold in remaining egg white mixture gently but thoroughly. Spoon into prepared ramekins, filling about 3/4 full. Drop one Nestlé Treasure into center of each soufflé; press in slightly. Place soufflés on baking sheet. Makes 2 servings. Recipe can be doubled.